The 'Pearl of the Indian Ocean', Sri Lanka is a stunningly beautiful island in the Indian Ocean, with an interior of dense tropical jungles framed by sandy golden beaches. The teardrop-shaped island is made up of a mountainous landscape with more than a hundred picturesque waterfalls and innumerable hiking trails leading to breathtaking vistas like the famous World's End. Sri Lanka is also home to diverse wildlife, including leopards, monkeys, crocodiles, and many species of birds; it is most famous for its elephant population however, and tourists flock to the elephant sanctuaries to get an up-close-and-personal experience with the majestic creatures. The ancient culture of Sri Lanka is just as fascinating as its natural attractions, and sacred Buddhist cities like Anuradhapura and Panduwasnuwara give visitors the opportunity to visit temples and other sacred sites dating back thousands of years. A holiday in Sri Lanka isn't for travellers looking for gleaming cities and sophisticated nightlife, but cities like Colombo and Kandy offer plenty of shopping and dining opportunities, as well as excellent museums that give unique insight into the captivating culture of Sri Lanka. While the island is often overlooked for more popular destinations like Thailand and Indonesia, a holiday in Sri Lanka is an enticing adventure for travellers willing to go off the beaten track. Sri Lanka's dry season lasts from November to April on the west coast, and May to September on the east coast; so the best time to visit Sri Lanka depends on where you want to go. The country's proximity to the Equator ensures that heat and sunshine are almost ever-present! Read more on Sri Lanka's Climate and Weather. -See the remains of an ancient royal fortress at Sigiriya. -Visit the ancient sacred city of Anuradhapura. -Wander through the busy markets of Pettah. -Get a taste of modern Buddhism at Wewurukannala Temple. Read more about Sri Lanka Attractions. -Visit baby elephants at the Pinnawela Elephant Orphanage. 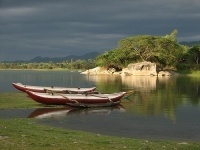 -Spot monkeys, leopards, crocodiles, elephants and other wildlife in Yala National Park. -Go on a pilgrimage to the summit of Adam's Peak. -Hike to World's End in Horton Plains National Park. Getting to Sri Lanka from the UK is fairly simple, as several airlines offer direct cheap flights to Sri Lanka from London. There are no direct flights to Sri Lanka from the US; however, there are indirect flights via several major cities. International flights land at Colombo's Bandaranaike International Airport. Get more information on Sri Lanka Airports. Running in the Family by Michael Ondaatje and Anil's Ghost by Michael Ondaatje. Elephant Walk (1954), The Bridge on the River Kwai (1957) and Flying Fish (2011). Ceylon Arrack, a traditional spriti distilled from the sap of the coconut flower or Portello, a carbonated grape flavoured drink that is popular with locals. Sri Lankan curry and rice served on banana leaves. Hoppers, a crepe-like bowl made from rice flour and coconut milk - it's a popular street food. Gold and silver jewellery and gemstones, brass and lacquer ware. It's best to bring to Sri Lanka all medications and toiletries you'll need, as the selection there can be limited. The National Festival of Kites sees the skies above Mount Lavinia Beach full of colour. Traditional forms of Sri Lankan art and dance are on display in Colombo on Navam Perahera National Day. More information on Sri Lanka Events. -Sri Lanka is the world's largest tea exporter, although the plant was only introduced in 1867. -Sri Lanka was the first country to have a democratically-elected female president. -Sri Lanka is sometimes affectionately called 'The Nation of Smiling People' thanks to its friendly locals. Breathtaking natural beauty and ancient culture make Sri Lanka the undiscovered gem of the Indian Ocean.